Speaker Van Jones was by far the inspiration of the convention. Sorry I haven’t summarized his speech for you. I hope these ideas inspire you. Look up Van Jones on Blackle to find video of some of his thoughts and speeches. if the U.S. accelerated the transition to a cleaner economy, millions of jobs in green construction and alternative energy could be created. Jones issues a moral challenge to the green movement. As we move from the margin to the center, who will we bring with us? He wants the “green tide” to lift all boats. There are plenty of jobs available in the renewable energy industry, and those jobs can’t be outsourced. We need people to create and install solar panels, build solar-thermal plants, create community gardens. The possibilities are endless. 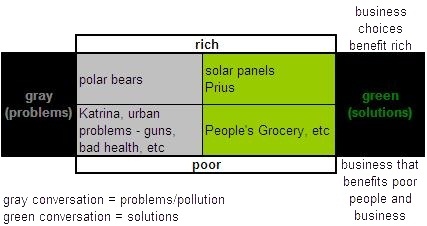 Jones has created a green matrix, which suggests that there are 4 ways to discuss energy and economy. The gray conversation is all about the problems. Rich people care about polar bears, rain forests, etc. Poor people couldn’t care less if you came to talk to them about the sad shape the planet is in when their kid has asthma and they need to put food on the table. The green conversation is about solutions – renewable energy, jobs. His example of the quadrant is below. The green solution for the rich is solar panels, Prius’, etc. The green solution for the poor is community gardens, the People’s Grocery, and green jobs. Who is right? Everyone, says Jones. We all have concerns and solutions, but the challenge is to include everyone in our green solution. Places like the People’s Grocery in Oakland deliver the benefits of a green economy to everyone. People have good, healthy food, jobs, and the environment benefits as well. Green jobs will stimulate the economy, elevate the poor, and help the planet. Green collar jobs have been created in the South Bronx, for example, to teach a young person to install solar panels, or weatherize a building, etc. We can’t outsource those jobs. If we can get young people into the green economy, they can be managers in a few years. They can invest in their community. They can teach others. They can create positive change for the future. “In a green economy, you don’t count what you spend – you count what you save.” – Van Jones’ Congressional testimony. We have the opportunity to save young lives, the soul of the US.